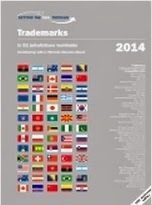 New Getting the Deal Through Trademarks 2014 - click the image below to view the full text. Reproduced with permission from Law Business Research Ltd. This article was first published in Getting the Deal Through Trademarks 2014, (published in October 2013; contributing editor: Michelle Mancino Marsh, Kenyon & Kenyon LLP) For further information please visit www.GettingTheDealThrough.com. On August 20, 2013, the Brazilian PTO published Resolution No. 107/2013, of August 19, 2013, which establishes an independent and facilitated procedure regarding article 125, of the Brazilian Industrial Property Law (Law No. 9.279/96) concerning famous marks in Brazil. The Resolution will enter into force after the Brazilian PTO publishes a new schedule of official fees including the fees for this new procedure, which is expected to be published in the upcoming days. With the entry into force of the new text, former Resolution No. 23/13 will be revoked. The new independent procedure for requesting the famous status of a mark is an improvement of the old system, where a request for the grant of the famous status of a mark could only been made incidentally, as a defense argument, during opposition or administrative nullity action procedures. Now, with the new resolution, such request can be submitted to the appreciation of the Brazilian PTO anytime during the validity of the mark. According to the new procedure, a request for the famous status shall be filed through a specific petition including all the necessary evidence of famous status of the mark, duly translated to Portuguese. Each requirement shall comprise only one mark and can be submitted at any time while the mark is valid. To be considered a famous, a trademark must fulfill three main requirements: i) wide recognition by the public in general; ii) high level of quality, reputation and prestige associated by the public; and iii) sufficient degree of distinctiveness and exclusivity. After the examination of the request and upon the publication of the grant, the famous status of the mark shall be valid for ten years, instead of only 5 years in the old system, unless the mark is cancelled before the end of said period or the decision of the grant is reversed. Finally, after the end of the ten year period, a new request may be filed in order to maintain the famous status condition. Dolce & Gabbana were sentenced to jail in the tax evasion case that dates back to 2004. The Italian judge sentenced the designers to eight months in prison. However, the sentence was suspended because under Italian law, sentences of less than three years are typically served via house arrest or community service. In addition, as noted by the Wall Street Journal, the designers have the right to appeal the verdict twice, and Italian courts often take years to reach a final decision. The public prosecutor of this case, Laura Pedio, stated that it was a "sophisticated tax fraud" and originally asked for a two-year jail term for the duo. If the conviction is upheld, the pair would also need to pay a fine to Italy's tax agency for € 500,000. Read more about the Dolce& Gabbana tax evasion case here. 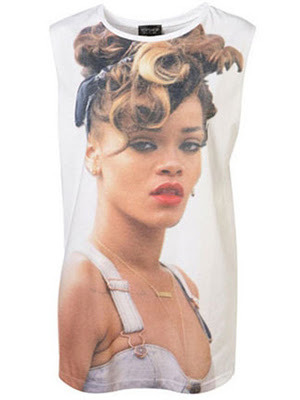 A t-shirt with Rihanna's face sold, without her consent or authorization, at the fast fashion retailer Top Shop at the end of last year led to the lawsuit by the singer against the retailer. The suit will be officially addressed at Her Majesty’s High Court of Justice this summer, according to to WWD. The unauthorized use of Rihanna's photo without her consent seems a straightforward argument for a case. According to WWD, Rihanna's representatives argue that the unauthorized use of her image suggests endorsement by association. However, in the U.K. there is no right of personality, which would mean that anyone who legally purchases an image can use it, unless it is a trademark. The decision of the High Court in the next months will tell which understading is correct and if Rihanna wins, it would be a landmark decision for the British court. Labor conditions are always an issue when it comes to the manufacture of garments because usually when companies outsource their manufacturing to developing countries pays, safety and other work conditions are jeopardized. 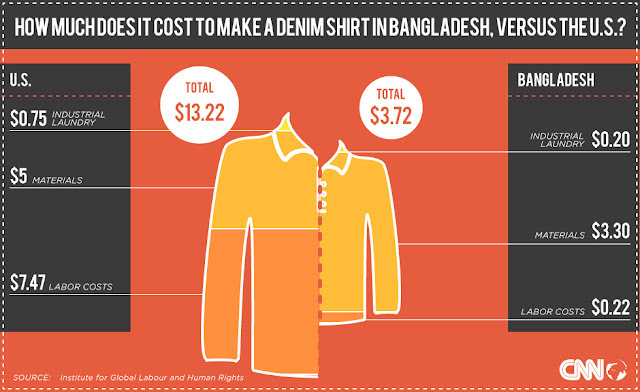 After the recent incident with the garment factory in Bangladesh, CNN posted the following infographic about the difference in cost of manufacturing a shirt in the US and in Bangladesh.